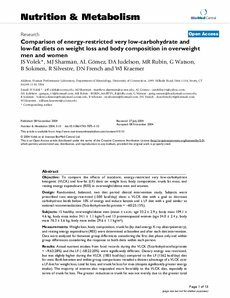 OBJECTIVE: To compare the effects of isocaloric, energy-restricted very low-carbohydrate ketogenic (VLCK) and low-fat (LF) diets on weight loss, body composition, trunk fat mass, and resting energy expenditure (REE) in overweight/obese men and women. DESIGN: Randomized, balanced, two diet period clinical intervention study. Subjects were prescribed two energy-restricted (-500 kcal/day) diets: a VLCK diet with a goal to decrease carbohydrate levels below 10% of energy and induce ketosis and a LF diet with a goal similar to national recommendations (%carbohydrate:fat:protein = ~60:25:15%). SUBJECTS: 15 healthy, overweight/obese men (mean +/- s.e.m. : age 33.2 +/- 2.9 y, body mass 109.1 +/- 4.6 kg, body mass index 34.1 +/- 1.1 kg/m2) and 13 premenopausal women (age 34.0 +/- 2.4 y, body mass 76.3 +/- 3.6 kg, body mass index 29.6 +/- 1.1 kg/m2). MEASUREMENTS: Weight loss, body composition, trunk fat (by dual-energy X-ray absorptiometry), and resting energy expenditure (REE) were determined at baseline and after each diet intervention. Data were analyzed for between group differences considering the first diet phase only and within group differences considering the response to both diets within each person. RESULTS: Actual nutrient intakes from food records during the VLCK (%carbohydrate:fat:protein = ~9:63:28%) and the LF (~58:22:20%) were significantly different. Dietary energy was restricted, but was slightly higher during the VLCK (1855 kcal/day) compared to the LF (1562 kcal/day) diet for men. Both between and within group comparisons revealed a distinct advantage of a VLCK over a LF diet for weight loss, total fat loss, and trunk fat loss for men (despite significantly greater energy intake). The majority of women also responded more favorably to the VLCK diet, especially in terms of trunk fat loss. The greater reduction in trunk fat was not merely due to the greater total fat loss, because the ratio of trunk fat/total fat was also significantly reduced during the VLCK diet in men and women. Absolute REE (kcal/day) was decreased with both diets as expected, but REE expressed relative to body mass (kcal/kg), was better maintained on the VLCK diet for men only. Individual responses clearly show the majority of men and women experience greater weight and fat loss on a VLCK than a LF diet. CONCLUSION: This study shows a clear benefit of a VLCK over LF diet for short-term body weight and fat loss, especially in men. A preferential loss of fat in the trunk region with a VLCK diet is novel and potentially clinically significant but requires further validation. These data provide additional support for the concept of metabolic advantage with diets representing extremes in macronutrient distribution.